If you're looking to make something a little different, look no further than these Lemon Snowbites Cookies. These little lemon sandwich cookies are easy to make and there's not a lot of measuring since they start with packaged sugar cookie mix. 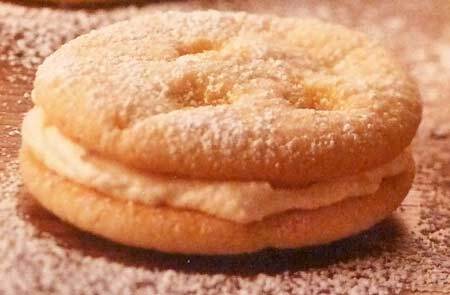 The filling is a mixture of lemon curd and whipped topping - which is perfect for these easy cookie sandwiches. If you've never had lemon curd, you'll definitely want to give this citrus spread a try with this recipe. Lemon curd is a cooked mixture of sugar, butter, egg yolks and fresh lemon juice which becomes quite thick by itself. So for this recipe, we lighten it a bit by mixing in some whipped dessert topping. In a mixing bowl, prepare sugar cookie mix according to package directions. Stir in crushed lemon candies. Cover and refrigerate dough for about 1 hour so it is easier to work with. Preheat oven to 375F degrees. Line cookie sheets with parchment paper and set aside. Roll dough into 1-inch balls and place about 2 inches apart on prepared cookie sheet. Bake for 7 to 9 minutes or until edges are firm and cookies are light brown on bottom. Remove from oven and allow cookies to cool for 1 minute on sheet before transferring to wire racks to cool completely. In a small bowl, stir together lemon curd and whipped topping and set aside. To assemble cookies, place a rounded teaspoon of filling on the bottom side of a cookie and top with another cookie, top side up. Sprinkle tops of cookies with powdered sugar. Refrigerate filled cookies for up to 3 days or freeze for up to 1 month. This recipe makes about 24 Lemon Snowbites.